Judge Chris Nicholson, who “belonged to the crop of judges appointed after 1996”, is the South African High Court judge who dismissed the case brought against president-elect Jacob Zuma. He held that Zuma's corruption charges were unlawful on procedural grounds in that the National Directorate of Public Prosecutions (NDPP) did not give Zuma a chance to make representations before deciding to charge him. 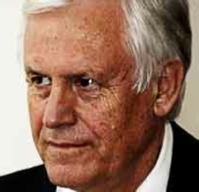 Nicholson added however that he believed political interference played a role in the decision to recharge Zuma. Appointed to the bench after democracy, Nicholson's legal background is human rights orientated. He was said to “belong to the crop of lawyers who were active in the difficult days”. Nicholson has authored two books, one on the brutal murders of Matthew Goniwe, Sparrow Mkhonto, Sicelo Mhlauli and Fort Calata (the Cradock Four) by apartheid security forces in 1985. His second was a biography of Papwa Sewgolum, the black golfer who beat Gary Player and was banned from playing as a result. Chris is proud to be a cousin of Alan Paton, author of Cry The Beloved Country. Chris Nicholson has written a new novel, One Hand Washes the Other, a remarkable account of a South African coach, inexperienced in football, coaching a new school team. In view of the staging in South Africa of the 2010 World Cup, this is a most intriguing book by the judge who in 2008 acquitted President-to-be Jacob Zuma of corruption charges.